J. Michael Lennon, Chair of Editorial Board (Wilkes University), Robert J. Begiebing (Southern New Hampshire University), John Whalen-Bridge (National University of Singapore), Philip Bufithis (Shepherd University), Christopher Busa (Founder and Editor of Provincetown Arts Press), Morris Dickstein (Graduate Center, City University of New York), Laura Adams Dunham (Independent Scholar), Michael Glenday (The Open University, United Kingdom), Hunt Hawkins (University of South Florida), Barry H. Leeds (Central Connecticut State University), Deborah Martinson (Occidental College), Michael Millgate (University of Toronto), Christopher Ricks (Boston University), Phillip Sipiora (University of South Florida), Thomas F. Staley (Harry Ransom Center, University of Texas at Austin), Barbara Mailer Wasserman (Memoirist). 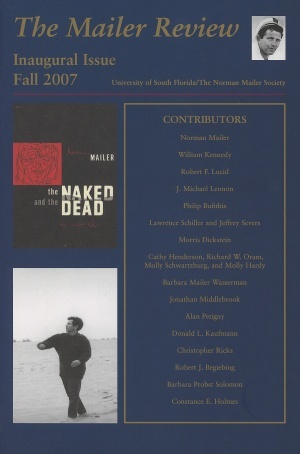 ↑ This bibliography has been incorporated into the project Norman Mailer: Works and Days so is not reprinted here. This page was last edited on 21 February 2019, at 11:46.